'Christmas Time' - Schreiner, R. 1964, I. 1965. 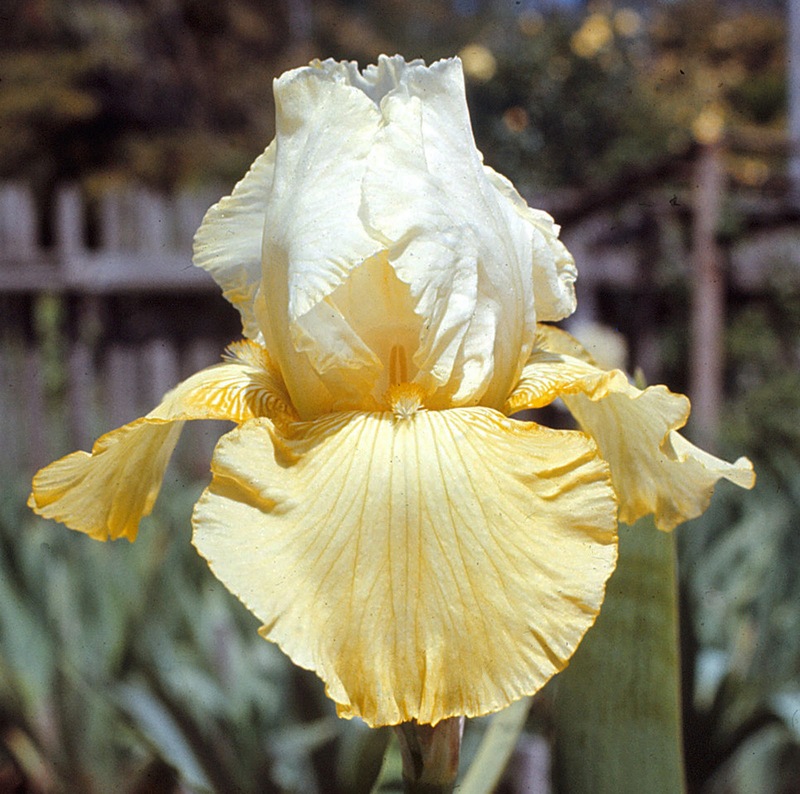 From Schreiner's Iris Lover's catalog for 1966: "A flashing thick red beard on a white iris makes the petals look even whiter. And when an iris is absolutely snow white to start with the intensification of frosty brilliance resulting creates a cynosure of beauty like sunshine on new fallen snow. 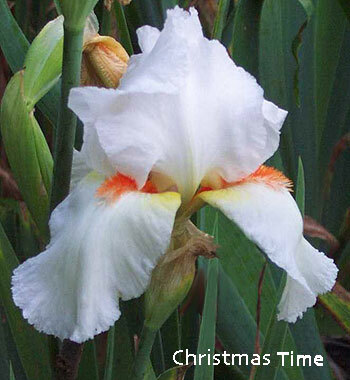 Such an iris is Christmas Time. Tall, soldier straight stems, 3 branches per stem and lots of buds with florets all lavishly laced and ruffled. 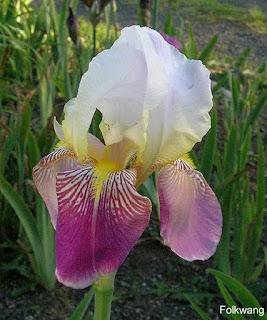 Uncommon, too, is the vigorous growth for an iris of this color." (White sport of May Hall X Arctic Flame), HM 1966, AM 1968. 'Santa' - (George Shoop by Keith Keppel, R. 1997, I. 1998). TB 34" M.
Standards blended cream strongly flushed peach buff in center; style arms deeper orange buff; Falls warm white, shoulders with large thumbprint overlay of pinkish salmon buff, petal reverse cream buff; beards poppy red; ruffled; slight sweet fragrance. (Tropical Magic X sib). Those of you who have followed my posts know I am not a fan of the modern iris form, however this iris was of such a remarkable color pattern it really caught my eye and was one of the few I photographed during a visit to Mid-America Gardens back in 2005. There are numerous varieties named with a Christmas theme. A whole bed could be done in nothing but them. Perhaps in your garden? I'd love to see it. All the best from AIS to you and yours this holiday season! May 2012 be even better for us all. 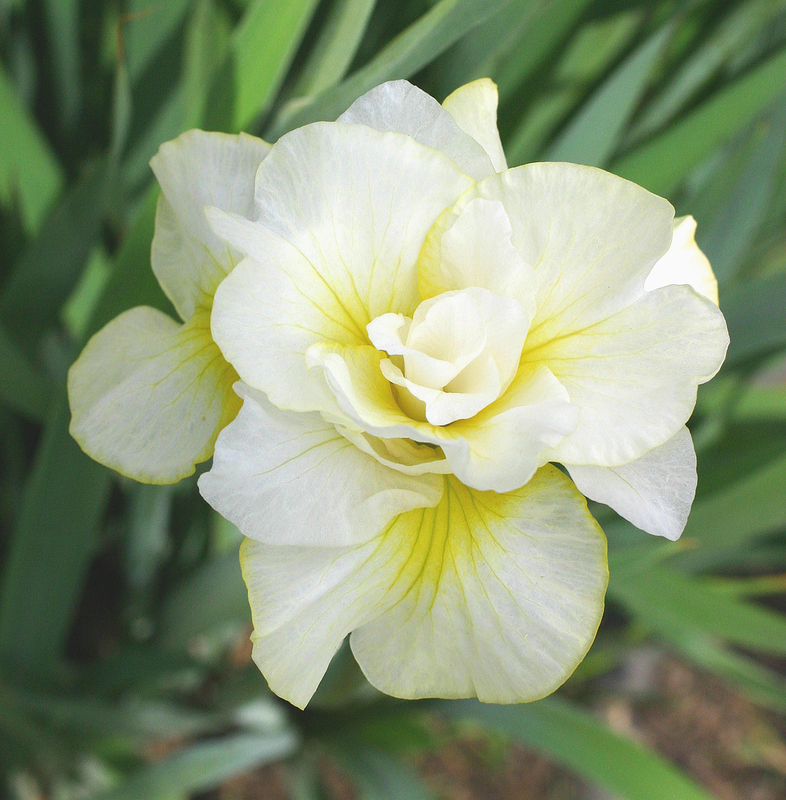 According to the American Iris Society Judge’s Handbook, “A reblooming iris (usually marked RE) is one that blooms in the spring and again in the same growing season.” They can appear in all iris classes. My twenty six years of work as a hybridizer has been focused on rebloom in the tall bearded class for zone 6. I reserve the right to chase distractions! 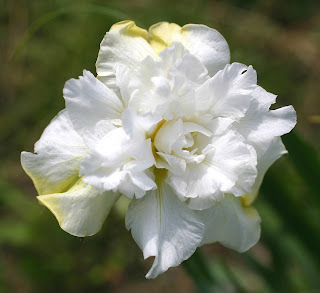 Rebloom is categorized according to the arrival of that additional bloom season. Currently, there are at least four different rebloom classes based on their rebloom behavior. This is important since all types will not rebloom in some climates. Repeat bloomers usually put up additional stalks about six weeks after the spring season. My ‘Summer Radiance’ creates a lot of interest when it blooms in July. The bright shiny yellow blooms can be seen for a great distance. Cycle rebloomers have a distinct second season of bloom in the fall. It usually follows a fall rain and cooler temperatures. In my zone 6, southern Kentucky, most cycle rebloomers open around October 1. A good example would be my own ‘Radiant Bliss.’ Louisville is more than a hundred miles north of my garden and they get fall rebloom earlier due to their earlier fall weather. Sporadic rebloomers produce unpredictable bloom stalks at varying times. These are the ones I call warm climate rebloomers. They do well in the southern tier of states, the west coast, and Australia. They rarely show reblooming tendencies in colder climates. When they bloom off season here, I’m like a kid in a candy store! Just as thrilling are the reports of rebloom on some of my non-reblooming children once they move to California. Both ‘Gilded Cream’ (Wilkerson 1995) and ‘Color Me Mysterious’ (Wilkerson 2011) are from rebloom breeding and have rebloomed in California. 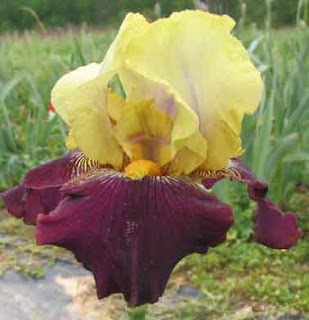 Endowed with stronger rebloom genes, multiple blooming irises have the genetic ability to bloom any time from spring through the first hard freeze. They were called ever blooming in the past, but this was misleading, as people expected them to bloom constantly from spring thru fall. Another term you may hear is whenever bloomers. They have this ability, but most will not automatically bloom this second time. With all rebloomers, much is determined by cultural practices and climate. In my zone 6 garden, it’s important to fertilize after the spring bloom and also to keep the plants well watered. If they do not receive approximately one inch of water every ten days or so they will go dormant and this will stop the rebloom. I recommend soaker hoses so the foliage doesn’t get wet in the hot summers. The spring only bloomers need to go dormant for the summer and may (often) rot under the very conditions that rebloomers require. Again, water and extra fertilizer create extended summer growth which can and does create rot in many spring only blooming irises. 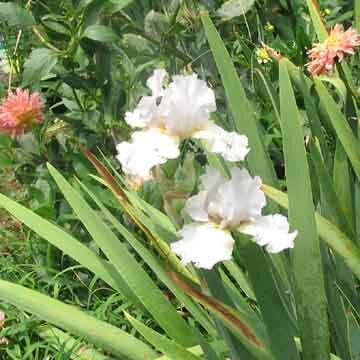 If you grow several rebloomers, it would be best to grow your rebloomers separate from the spring only irises. 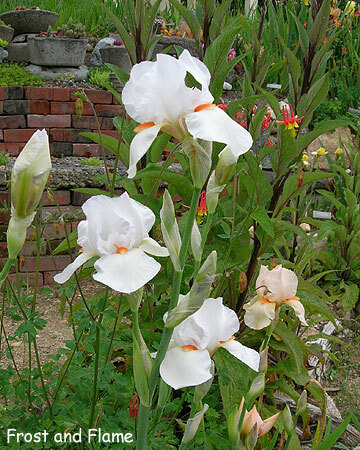 On a personal level, I consider rebloomers to be garden irises. I make a conscious effort to promote good branching in my seedlings, just in case they make it to an AIS sanctioned show either spring or fall. It’s rare that rebloomers are seen at the National Convention Gardens, or in spring shows. “Why is this?” you ask. Timing! Most rebloomers have an early spring season and have finished blooming by the time the shows and the tours take place. In the off season, they are the stars of the garden. For the record, I don’t go crazy over terminology. I will report rebloom in this way, “It’s blooming now, or it bloomed at this time.” There are no guarantees with rebloomers. Mine is a difficult climate. I get excited over maiden (first) bloom in an off season, even though I know it may never rebloom again. I’m depressed at the end of spring bloom season and I dislike the first freeze each fall. 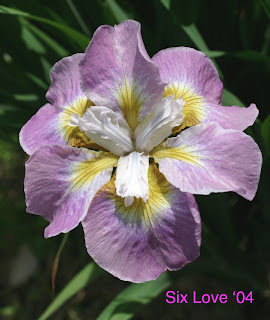 I’m such an iris addict that I welcome, encourage, and enjoy an iris blooming at any time. Sometimes I think the breeding program is just a way to stay involved in irises year round! How did I get involved in reblooming irises? 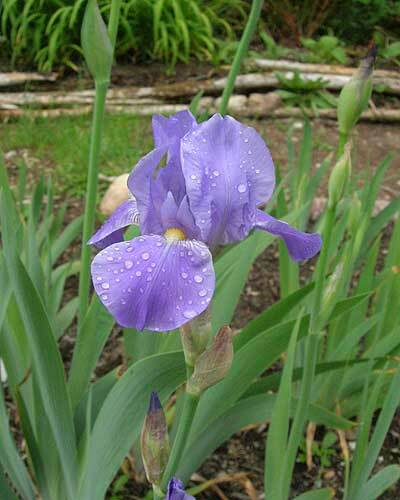 In 1982, the Henry Field’s catalog listed “fall irises!” This was my introduction to reblooming irises. Thus, my obsession began. If you love irises, why not grow the type that blooms a second and sometimes a third time per year? If I had my way, everyone would grow and breed rebloomers. Don’t you agree? There are Internet sites, including the American Iris Society, where you can increases your knowledge of irises in general. Many things, including the iris encyclopedia and commercial links, are available through the AIS site. There is a Reblooming Iris Society devoted to rebloomers specifically. 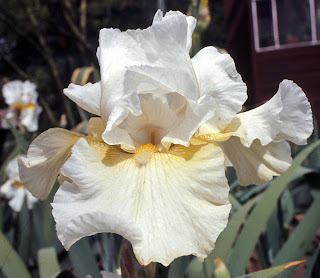 There are archives in place for both iris talk and iris photos, online email lists about irises. These archives contain a really good supply of iris information with a search engine. Good reading for the winter season. The reproductive parts of the plant (stamens, stylearms, ovary) are converted to petal--like structures (petalloids). Example 1 shows a seedling where this is the predominant effect. Flowers are hose-in-hose where a second (or more) flower grows up inside the first one. 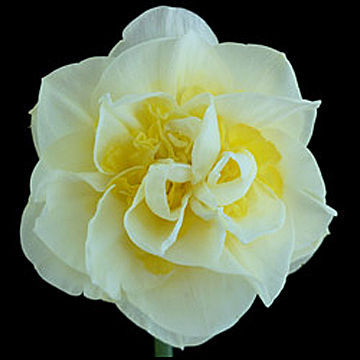 This can be seen in example 2 with a second complete flower growing up inside the first. 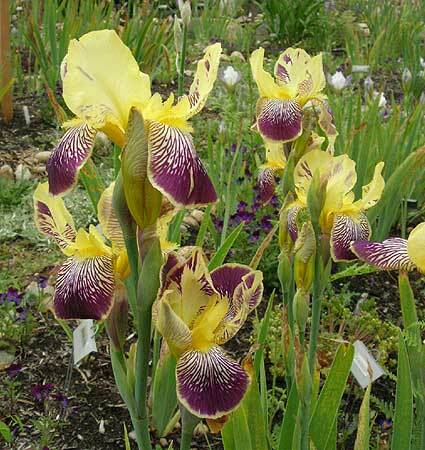 Incidentally, this iris was introduced recently as Double Play. The flower has six falls through the conversion of the normal three standards into falls and with the sexual parts of flower unchanged. Example 4 shows this effect (introduced as Six Love) but we won’t be talking about it further here. The first two effects can be created by the same mutation – a master gene that turns on the machinery to produce ovary, styles and stamens loses its activity and the master gene controling petal formation in the same cell comes alive and takes over, so we get lots of extra petal-like structures at the expense of the reproductive parts. The same master gene is also responsible for making sure that only one flower is produced from each terminal flower meristem. When it loses its function this means that more than one meristem can produce flowers, hence the hose-in-hose, multiple flower effect. The 6- fall trait is caused by a different mutation that acts specifically in controlling production of the standards (petals). These effects can occur together complicating things further in terms of flower structure. So that’s the basics of how it happens, but why get excited about it? Well, everyone likes variety and mutipetal flowers are very popular in many of the major ornamental groups e.g. Japanese iris, peonies, dahlias, lilacs, roses, petunias, and daffodils. More petals more flower power. Oh, by the way did you spot that the photo in example 3 is a daffodil and not an iris? The control of flower form is similar across most, if not all, flowering plants and the same kinds of mutations occur so that we see these related multipetal effects everywhere. In addition to the extra fullness, several special effects are possible with multipetals including repeating expression of falls with strong blaze signals as in Kaboom (Bauer-Coble, 2001: Example 5), or alternating layers of color when you have a hose-in-hose structure in a bicolor or amoena iris (color/white/color/white sequence) as shown with the seedlings in examples 6 (not fully open) and 7. These need further development but the effects already make some novel and rather beautiful flowers. Rousseau has hit on a real problem here. At least with the current multipetal Siberians, it would be wonderful if every flower looked the same and was as well organized as the ones in the photos, but sadly, that isn’t so. 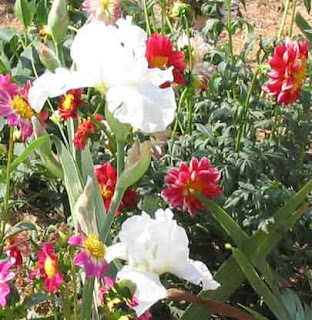 Every flower on the plant may be different, and some can be less organized in form and quite untidy. Why is this? The probable answer is that there are two copies of the genes for each trait in diploid plants. In the case of multipetal Siberians only one of these two genes is in the mutated state and the other is “normal”, so these two control systems fight it out in each flower – sometimes the mutant form predominates and the flower is almost fully doubled and seems symmetrical; in other cases the normal gene tends to compete better (for unknown reasons) and the flower is less double and quite mixed up in its structure. Only by finding a way to get both these genes in the mutated (inactive) form can one put this battle to rest and expect to get fully double flowers every time. And this is not so easy to do when the reproductive parts of the flower, especially the ovaries, are heavily modified or not present! There is some pollen on the sides of the petalloids at times which is active and allows crosses to be made quite readily with standard Siberians, but, so far, crosses with mutipetals as the pod parents have been unsuccessful – and these plants never seem to produce bee pods either. So should we redouble our efforts to get these potentially perfect (and perfectly sterile) multipetal forms or is it more trouble than it’s worth? While looking for an iris to highlight for you this week that might be appropriate to the season I thought of my old favorite 'Frost And Flame'. It seems a perfect fit for this cold and dark time of the year, as we await the changing of the seasons and return of sunshine and spring blooms. 'Frost And Flame' is just one of the hundreds of beautiful irises created by legendary hybridizer David F. Hall. 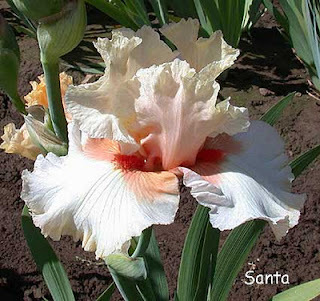 He is most remembered for his lines of Flamingo pinks which revolutionized the iris color palette and this lovely tangerine bearded white came from the same breeding program. Introduced to the iris world in 1957, the flowers are large and of a pure snow white with a flaming tangerine beard glowing like an ember at the heart. Of good substance and flaring form, it is a tall variety easily reaching four feet in good conditions, and blooms early in the tall bearded season. It attained a well deserved Award of Merit from AIS in 1959. Dave Hall in his garden. Photo by Robert Schreiner. David F. Hall was born in Blenheim, Ontario, Canada, on August 15, 1875. At a young age he moved to the United States and became an attorney for AT&T. He retired at 65, relocated from Chicago to Wilmette, Illinois, and devoted himself full time to flower hybridizing. The world is richer for his efforts. 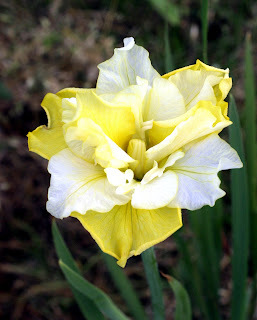 He introduced some 300 irises and daylilies from the 1920's through the 1960's. He was 93 years of age when he was struck and killed by a train in 1968. 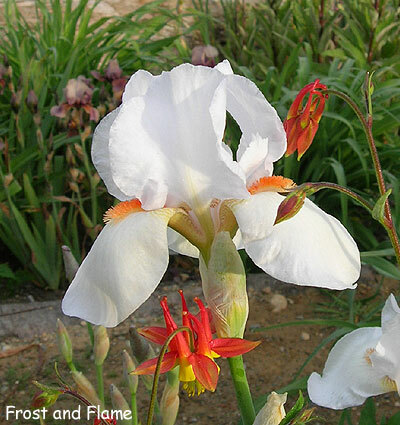 'Frost And Flame' has the wonderful ability to look good with just about any other color of iris. It compliments variegatas and pastels alike, and made a particularly good show in my garden a few years ago when a red and yellow columbine (Aquilegia canadensis) grew beside it and bloomed profusely about the clump. It is truly an iris classic and is as beautiful in the iris garden today as it was when it made its debut over half a century ago. 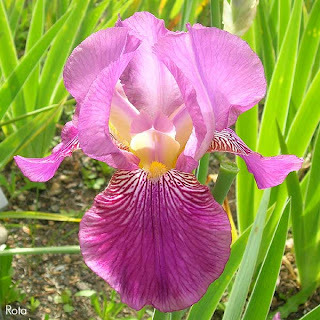 UPDATE: On the AIS Facebook page Tom L. Waters comments: "It's a lovely iris, and also a great example of the power of a good name. "Frost and Flame" is dramatic, descriptive, and unforgettable. I'm sure every hybridizer of a red-bearded white since has bemoaned the fact that the best name has been taken." So true! One of the things that truly makes an iris a classic is a great name to go along with outstanding beauty and performance. 'Frost And Flame' has it all! Thanks for the reminder, Tom. 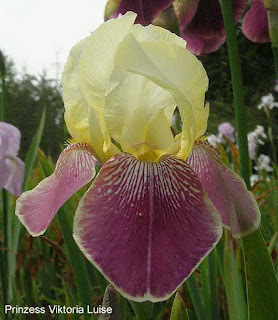 I have never been a great fan of green irises or caught up in the attempt to hybridize them, though I do like green as a color in cymbidium orchids; however, when I became the selector and introducer for the Roe irises, it was an immersion in green. At a later date, Edith Coscarelly turned over to me Bernice Roe's slim stud book—I had been there at the inception of her record keeping since my first summer job was digging orders from her at the garden on Bird Avenue. I was paid minimum wage, given a sandwich at lunch, an afternoon nap, and, best of all, at the end of the season I could take home all the extras that were left over. Bernice did a couple of things that were odd. For many years, she kept the names of all varieties at the back row, instead of at the front of the plant. Needless to say with all other gardens in the area labeling from the front, it created some confusion. Her garden tags were redwood stakes marked in liquid embroidery—how is that for a blast from the past and down memory lane? It was that summer that I convinced Bernice to start to keep real records and she did, although she had already been making crosses for many years most likely from the early 1950s. Until I worked for her, Bernice kept all parentage on stakes—there were no paper records. At first it did not seem like a big deal until her obsession for green and, especially, green amoenas started to give results. In the end, we introduced two good green amoenas, Vernal Falls and Misty Moonscape, and one cream-white with green toned shoulders, Irish Spring—the one that I like best. When it finally came time to register these irises, the garden stakes were missing and Bernice, insisting that sooner or later the stakes would turn up, could only give me a general idea of what she had crossed. She was sure she had used Jean Steven's Pinnacle and only thought she had used Summit. In the mix had gone the green irises of the time—Lyon's Char-Maize , Cool Valley, Singing Pines from Plough, and others varieties. We did know for sure that she had used Piety; possibly DeForrest's tangerine bearded Francis Kent. The stakes, of course, never showed up and the exact parents are a mystery as is the ability of the three irises mentioned above to produce F1 tangerine beards in their seedlings. Bernice's green could be tender in cold climates and I suspect that is due to Char-Maize. If nothing more, this muddle is a cautionary tale for all hybridizers to keep good records. 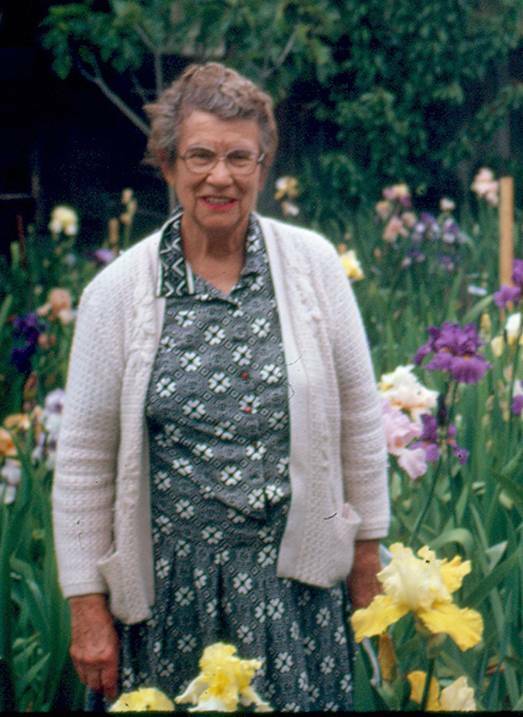 When I came to write about Bernice's green breeding I realized there was also a larger picture that many of the hybridizers in the 1950s made with white x brown crosses, thinking those crosses would produce green. 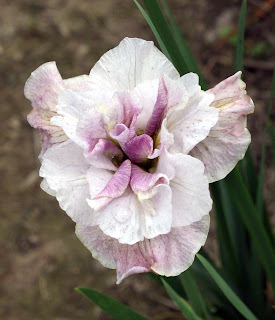 The important Knopf irises go back to white x brown crosses. And the original white x brown crosses are now behind a wide variety of different colors. Other hybridizers used different approaches to green breeding with good results. For many years, Neva Sexton always said she wanted to create a goose green flower—to understand what she meant, it is necessary to remember that geese have a front and back end; however, none of Neva's green attempts were every named and sold. Early in his hybridizing career, Joe Ghio produced good green approaches—Meadow Mist and Oasis came to my mind. 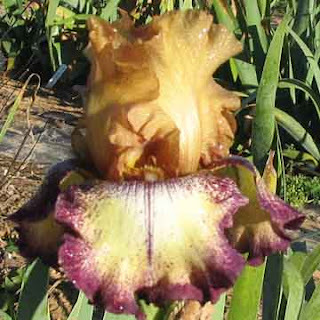 Other hybridizers would continue to pursue and continue to hybridize for green—Noyd's Pride of Ireland was popular for many years and just recently Schreiner's won an AM on County Cork, a greenish-yellow. Goos & Koenemann was a renowned German nursery firm located near Niederwalluf am Rhein starting in 1885. Max Goos and August Koenemann were good friends who both delighted in horticulture and loved flowers. 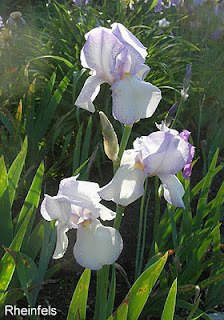 Tho they made many great additions to the plant world they are best remembered today for their irises. 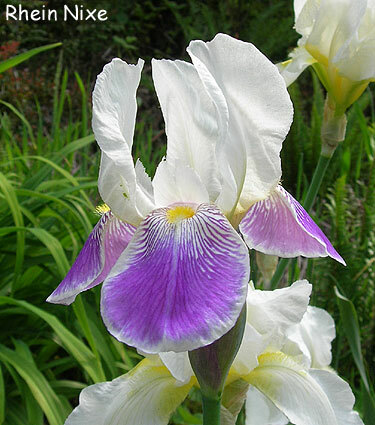 They began hybridizing irises early in their career and introduced some of the most popular varieties of the early 20th century. They won many awards and accolades for their efforts. 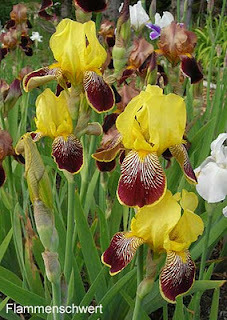 They were also one of the first firms to create and introduce intermediate sized irises. August Koenemann died in 1910 at the young age of 46, and Max struggled to keep the firm going without the salesmanship of August. He hired Friedrich Bucher to take his place, and his son Hermann Goos also joined the firm around the same time as an apprentice while he was still in his teens. Max Goos passed away in 1917, only 58 years of age, and Friedrich and Hermann continued the firm until Hermann died in 1933 at the young age of 37. The firm continued under other names and owners until it was closed in 1953. 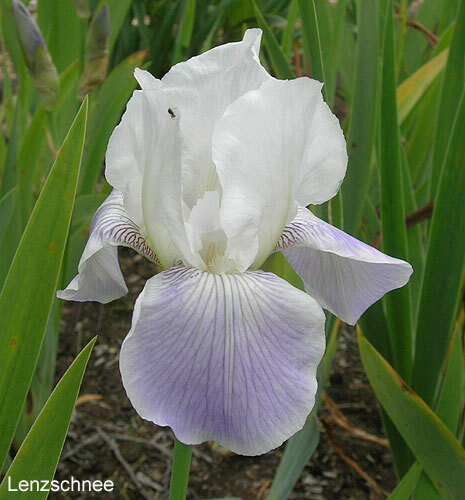 Collectively notated as G&K in iris registrations, these four men did much to advance the colors and patterns of the early diploid irises, as well as popularizing the intermediate class. There was some controversy at one time over whether they had really created their intermediates themselves - it was rumored by one irisarian of the day that they had resold Caparne IBs as their own under new names - but history does not support this accusation. You can read all about the history of this great firm and the men behind it in Clarence Mahan's book Classic Irises, or in the G&K Chronicle sold by HIPS. Many of their varieties were imported to the US in the first decades of the 20th century and were very popular with gardeners in the German regions of the east, and much loved by the early iris collectors and hybridizers. Many of them are still with us today. Here are several of my favorites. As always, click the photos to see larger versions. 'Loreley' is probably their best known variety, and the most widely distributed. It is extremely hardy and thrives in neglect, so is often found growing along alleyways and in old gardens happily blooming away. Tho sloppy in form, it has a wonderful charm due to its habit of splashing the yellow standards with the reticulated red-violet of the falls, giving it a very festive appearance with no two blooms just alike. And so many blooms! They go on and on thru the season. 'Loreley' is named for the siren of the Rhine who lured sailors to their death with her enchanting song. This lovely iris still draws flower lovers into her spell today. In 1910 they introduced another classic variegata, this time one with perfect form and clean standards of pale yellow over falls washed violet and edged in cream. A short variety, 'Prinzess Viktoria Luise' is very hardy, blooms over a long period with many flowers, and is one of the loveliest of this color pattern, of which G&K introduced many. Visitors to my garden often remark on it, even tho it is not one to grab your attention immediately. 1910 also saw the introduction of 'Rhein Nixe', named for a water spirit associated with this famous river. This is one of the finest examples of the amoena pattern found in the early diploid irises. Its crystalline white standards rise above falls of the same pure white almost fully washed a medium blue-violet, with just a faint edging of lighter purple fading to white. It is very tall for its day, easily reaching three feet or more in my garden, and makes a beautiful show when a clump is in full bloom. It is not the most floriferous of varieties but more than makes up for it with its charm and personality. In 1914 the beautiful blue 'Kastor' was brought out. There was nothing else like it in color at the time. A short iris, it has perfect form and exquisite coloring, being a self of purest deep lavender-blue with a light yellow beard. 'Kastor' has a delightful sweetness about it and is perfect for the front of the iris border. We'll jump to 1920 for this next variety. 'Flammenschwert', meaning 'flaming sword', shows us the classic variegata color combo of gold and rich red. Tho it is a shorter variety its small blooms really make an impact due to their bright colors. The clean standards arch above the heavily reticulated falls that are edged in the same bright, sunny, golden yellow of the standards. It usually has multiple flowers open at once and is reliable of bloom, showing off almost every year in my garden even after division. Next comes 'Rheingauperle' from 1924. 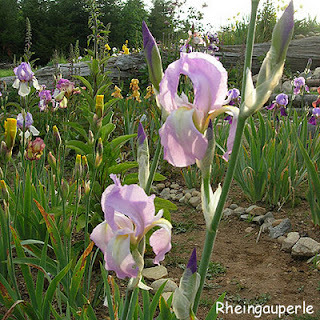 Well named, meaning 'pearl of the Rheingau', a wine producing region north of the Rhine, it is truly a gem of an iris. Tall stems bear flowers of a lovely, delicate, orchid pink with a heart of white. The white beards fade into soft yellow-orange in the throat, and the form is long and open with the petals far more narrow than usually seen. It is enchanting, especially with the morning sun shining thru it, and was one of the best pink-toned irises of its day - and widely celebrated because of it. That same year a beautiful intermediate was also introduced. 'Rota' was the polar opposite of 'Rheingauperle', being short, with bright rosy-violet blooms featuring wide, rounded, flaring falls and arching standards. This one really makes a splash of color and grabs every eye early in the tall bearded season. The beautiful 'Folkwang' was introduced in 1925 and was different from anything that had come before. White standards faintly flushed pale pink stand tall over falls of bright rosy-violet. 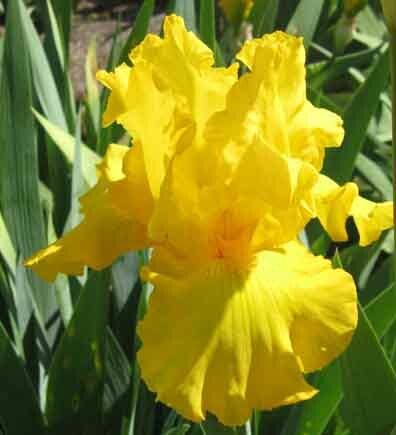 The beards are soft yellow and the same shade glows at the heart of the flower, lightly flushing the base of the standards. Not the best in form, it makes up for it with its unique coloration, tall display, and sweet scent. 'Lenzschnee', meaning 'spring snow', is another uniquely colored variety. A lovely soft white self with the falls lightly blushed palest blue-lavender, it is a charmer, and looks lovely with the other pastel varieties from this great firm. On the short side for a tall bearded variety it is soft and lovely, and brings admiration from anyone who chances to stop and inspect it. It was introduced in 1927 and is greatly admired by collectors of historic varieties. The last variety I will share with you is from 1928 and brings the same color tones of 'Lenzscnee' but this time in a plicata pattern. The white blooms of 'Rheinfels' are delicately stitched along the margins with pale blue-violet. It is named for a set of falls on the river Rhine, and the flowers certainly cascade forth during the height of the season, as a full clump tosses masses of beautiful blooms into the sunshine. With its perfect form it is one of the very best of the early plicatas and blooms realiably. This post could go on and on with all the amazing and beautiful flowers created by this exceptional quartet of men. There is the lovely 'Brising', the early blooming off-white 'Ingeborg', the uniquely colored 'Nibelungen', and so many more, but we have to end somewhere. If you love the delicacy and charm of the old diploid irises you could not do better than to collect the varieties of G&K. They are classics in every sense, and a wonderful legacy for the work of these men who devoted their lives to plants and brought so much beauty to gardens across the continent of Europe and around the world.